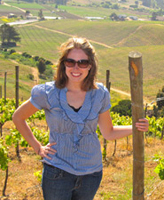 Erin Jelm ’10 can’t remember a time when she wasn’t interested in Latin American studies. “I’ve always had an interest in cultures,” says the anthropology and marketing alumna, currently working as a marketing specialist at Santiago Adventures, a tour operator in Santiago, Chile. “In high school my Spanish teacher would bring in pictures of her travels. She got us excited about taking advantage of opportunities to live and study abroad. It’s not too surprising then that Notre Dame’s strong study abroad and undergraduate research programs had strong appeal for her. During her undergraduate studies, Jelm participated in Notre Dame’s Toledo ’07 and Santiago ’08 programs. To prepare, she immersed herself in the Spanish language and literature and culture of each country. However, when it came to determining her senior thesis project, Jelm only had to travel to South Bend’s west side and immerse herself in the city’s Mexican immigrant community. The senior thesis, she says, was a logical outgrowth of her interests. Jelm’s research examined how close non-family relationships create the social leverage to help immigrants become established as permanent residents. She says the academic research she did challenged her to become a more independent and critical thinker, prompting her to consider the broader, more subtle implications of the theories and concepts she studied in class. On a very basic level, the research experience confirmed for Jelm that the things she read about in class—certain cultural trends and behaviors, for example—were actually present in the real world. “Through personal interaction with the local (South Bend) community, I became convinced that my research had a purpose and a real potential to effect concrete and positive change in the lives of others,” she says. “(There are) real-world implications to academic research that can serve to change the way that, for example, financial institutions reach out to and work with the Hispanic community, which in turn means that population’s needs will be better served. Jelm’s thesis is being incorporated into a larger piece directed by Karen Richman, Director of the Center for Migration and Border Studies in the University’s Institute for Latino Studies. The article is currently being submitted to the Journal of Family and Economic Issues. As a professional now living and working abroad in Chile, Jelm says she uses and is improving skills she initially learned through her undergraduate experiences in the College of Arts and Letters. “Participating in research helped me develop important professional tools such as critical thinking, problem solving, and creating a framework for collecting, synthesizing, and presenting information,” she says. Originally published by Ann Price at al.nd.edu on March 08, 2012.